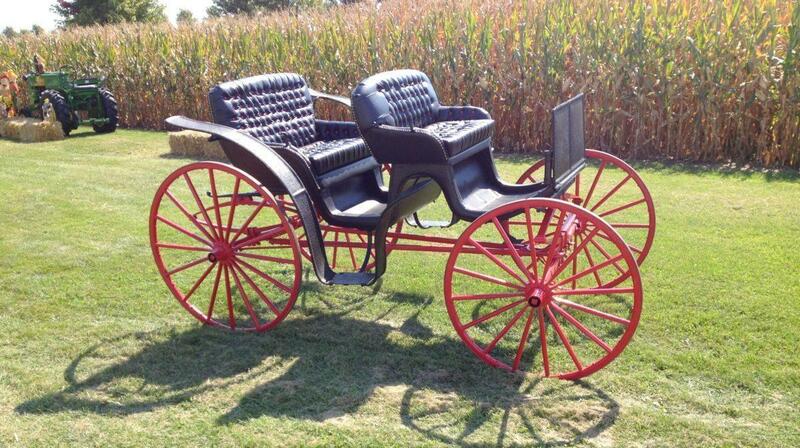 The Four Passenger Four Wheel Phaeton Carriage on display in Ken’s collection was acquired by Ken around 1976 from a restaurant owner in Plano, IL who used it as a lawn display in front of his restaurant. At one time Ken had a driving horse that he used to pull the carriage. It was great fun for the Nagel family to ride in the carriage in the Plano 4th of July parade dressed as characters from the TV show, The Little House on the Prairie. Little is known about the history of Ken’s carriage other than that it was manufactured in Ottawa IL by a builder who is no longer in business. In 2013 Ken had it refurbished. All the leather was redone. The wood and iron fittings were repainted in their original black and red to withstand the weather. Ken’s Phaeton features solid axel running gear front and rear, sprung with a transverse leaf spring in the front and a longitudinal leaf spring in the rear to soften and stabilize the ride. Well-padded leather covered seats tufted with contrasting red buttons adorn the interior and provide a soft and comfortable ride. Fenders over rear wheels help shield the passengers from road grime. Large running wheels were necessary to negotiate the rough and unpaved wagon paths. Phaetons were often fitted with running light lanterns for night travel. Styles varied from the plain and simple to extravagant conveyances built by the most exclusive coach makers for Royal and wealthy clients. Phaetons (also Phaéton) were a form of sporty open carriage popular in the late eighteenth and early nineteenth century. Drawn by one or two horses, a phaeton typically featured a minimal, very lightly sprung body atop four extravagantly large wheels. With open seating, it was both fast and dangerous, giving rise to its name, drawn from the mythical Phaëton, son of Helios, who nearly set the earth on fire while attempting to drive the “chariot of the sun”. With the advent of the automobile, the term “Phaeton” was adapted to open touring cars. The automobile versions were often the most expensive and elaborate offerings from a manufacturer. Most featured dual cowls with wind screens, canvass tops and side curtains to ensure the comfort of passengers in inclement weather. They are among the most prized motorcars by serious collectors of early automobiles.